PMBComment: one of the most interesting debates raging in Venezuela today is if Cuba has colonized Venezuela, or on the contrary, the island has become an annex of Venezuela. The matter is relevant because it is more than obvious that the main beneficiary of the Bolivarian Revolution is the repugnant nomenklatura of the island-prison. They have seen their political fortunes resurrect with the price of oil and as a direct result of Chávez’s growing dependence on their recognized survival and despotic skills. A de-facto Confederation has arisen between Cuba and Venezuela, and not surprisingly the bankers at that other Confederation: Switzerland, are all smiles. The attached internal Board document from PDVSA shows one more dimension of this intimate relationship. A company that was once chastised - by Hugo Chávez - for investing in social infrastructure in the areas surrounding its operations in Venezuela - a “state within a state” was the favored epithet – today approves millions of dollars for investments in endogenous social development (sic, and an oxymoron) in Pinar del Rio, Cuba. Tapping Venezuela’s oil wealth was always an obsession of Fidel Castro who in the early 1960’s trained and financed guerillas to undermine the country’s nascent democracy. The resolve of a nation and the fidelity of its Armed Forces put an end to the absurd pretensions. For the next three decades, but particularly after the nationalization of oil in Venezuela in 1976, Castro attempted to draw PDVSA into Cuba. He offered us the “opportunity” to invest in his decrepit US-expropriated and Soviet-retooled oil infrastructure and also tried to entice PDVSA to explore for oil in offshore blocks. Time and time again, PDVSA's Board passed on theses “opportunities”. Fidel could never understand why a state-owned enterprise could refuse to follow the lead of what he opted to believe were sincere expressions of interest from Venezuelan ministers that visited the island out of curiosity more than real commercial interest. The control of PDVSA became a must for the Cubans after the April 2002 fiasco. A few weeks before these unmemorable events, oil shipments to Cuba had been suspended due to lack of payment. 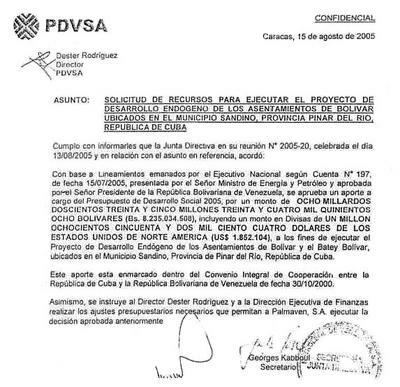 Even after Chávez returned to power and Ali Rodriguez – Cuban trained guerilla leader of the 60’s (a.k.a Comandante Fausto) – was installed as CEO of PDVSA, the negotiations to refinance what at the time was a measly $146 million dollar account payable for CUPET went nowhere. At the time, PDVSA continued to be run under strict commercial rules, and management was not about to risk legal sanctions for succumbing to political pressure in this case. The Cubans were outraged and frustrated that junior officials at the company could disregard Rodriguez’s orders. That all was solved after Chavez lured dissenting managers into a strike (he relishes telling the story of how he was the mastermind behind the disastrous two-month-long “paro petrolero”) and proceeded to first lock-out striking workers, and then fire them and anyone else they felt had failed to understand that the revolution was here to stay. With 19,000 workers conveniently out of the way, the company’s ability to function evaporated instantaneously, but Cuba’s ability to milk it was significantly enhanced. According to some estimate the unpaid bill for PDVSA’s crude and oil products shipments to Cuba stands at US$4.3 billion. 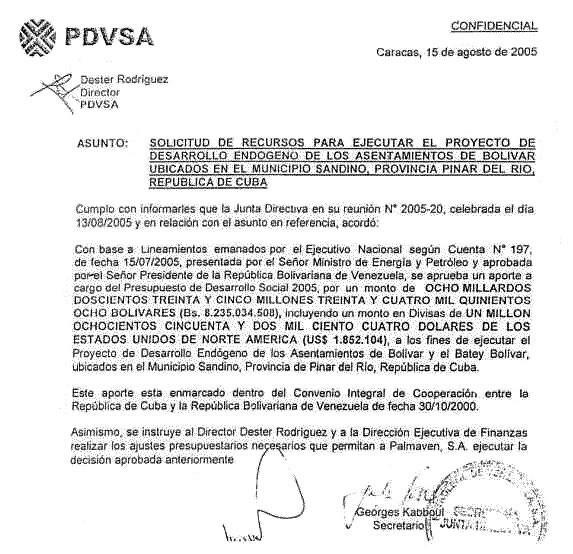 Since no formal audited accounts are published by PDVSA it is hard to know for sure this, or any others hard facts about the once powerful, competent and transparent company.. Every so often the amount is apparently “amortized” by assigning some ludicrous deemed value to Cuban doctors, trainers (for sports and asymmetric warfare) and all sorts of “experts” who act as if the country is indeed theirs. The going rate for this “technical assistance” would shame Harvard educated surgeons, German Olympic coaches, Sandhurst’s toughest and McKinsey’s golden boys and girls.